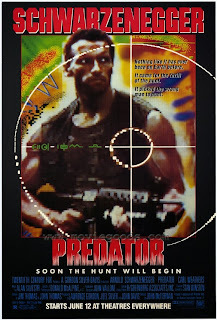 I knew going into Predator that it was one of those So Bad That It's Good movies. It's an Arnold Schwarzenegger vehicle, what can you expect, right? Well for one thing, I didn't expect the movie to be actually bad. Don't get me wrong, there were definitely moments I did enjoy, and some of them not even in an ironic, "laughing at the movie instead of with it" kind of way. There's a panning wide shot early on which gives a sense of the mystery and fear of the jungle as well as the group's camaraderie and cohesion. Then on the ironic side of things, there's the signature bad puns encompassing everything from shouting "knock knock" after knocking down a door to telling an enemy to "stick around" after being stuck to the wall with a dagger. There are also these terrible hypermasculine jokes about women, but this is where the movie starts to go from fun-bad to just regular bad-bad. The overflow of machismo coming from this movie is a little too much for me. I mean, even the premise of the Predator itself—a monster who hunts humans for sport—seems engineered for mindless action nonsense. Then there's the fact that the writing is simply awful. Why do they immediately kill the company of soldiers they encounter in the jungle? Why do they decide to keep Anna alive but no one else? How do they know she has valuable information? If she's important why do they make no effort to keep her well guarded? If the Predator is only in it for the sport then why does he use such unfair alien technology? Why does mud make Dutch invisible to the Predator's heat vision? If Dutch knows the Predator didn't kill Anna because she was unarmed, why don't they all drop their weapons and walk away? I understand this isn't the type of movie you go to for the plot, but it really just doesn't make sense to the point of being distracting and taking away from the experience. I'm sure there are people who love this movie regardless of what anyone says, I'm just not one of them. Riddick is more my flavor of bad sci-fi. - I thought it was weird that they introduced the idea of an alien adversary in the first shot of the movie and then never really returned to this aspect of the Predator's origins. I mean, I know the story's thin, but it just seemed like an obvious omission. - Alien vs. Predator is clearly not a reflection of the quality of each film franchise since if that were the case Alien would have won in the first 5 minutes and the rest of the story would just be another Alien movie. - No matter how many movies you put him in, Arnold Schwarzenegger is not a good actor. Haha, yeah I guess it is slightly moronic. I like movie reviews that rip a film to pieces. I haven't seen this movie for a long time and I've never purchased the DVD, but I do remember it scaring the crap out of me as a kid. That's something about the movie I can appreciate and perhaps makes me overlook all its flaws. 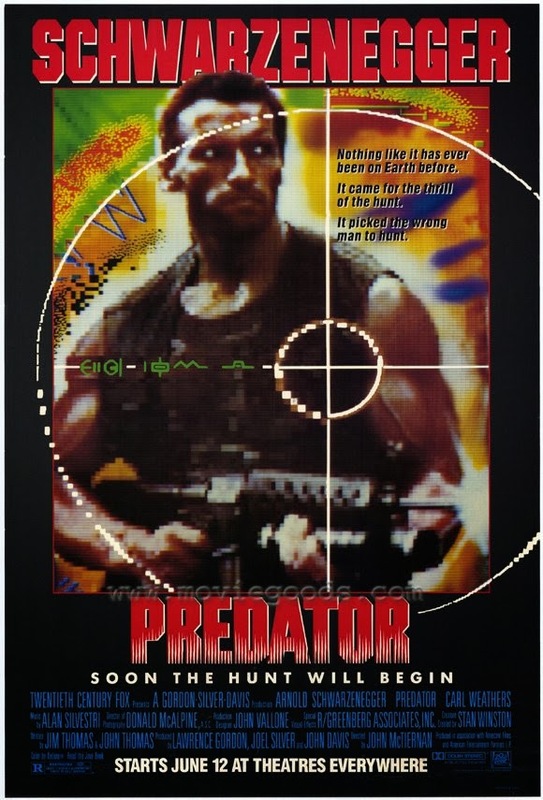 I can tell you, I enjoyed 'Predator 2' and the recent 'Predators', as well as 'Alien Vs Predator' so maybe I'm not that deep - I think audiences are just intrigued by the character, enough to ignore the errors in the screenplay. I would say the first movie is good-bad rather than bad-bad, and perhaps it's more cheesy in a good way, like 'Riddick', like 'Independence Day'. Thanks! Yeah I think I'm a bit of an outlier when it comes to this movie. Even Roger Ebert liked it when it came out. It has lots of fun action scenes, and the fact of its complete lack of storytelling means it never gets bogged down or boring. It just didn't work for me, I couldn't force myself to care about these empty vessels. Thanks for the comments as always!